For a few years now I’ve had many folks ask if I have tshirts…..answer was always “maybe next year”…..well…next year is here! I worked hard on developing a design that us light tackle folks could relate to and appreciate. While fishing, I am always after a challange of catching a big one or catching nice fish in several species on the same trip. Severeral species on one trip is called a “slam”, I like “slams”! ….. So…..with that in mind I decided to design a shirt which highlights light tackle and the challenge of catching different species with a little “Walleye Pete” in the mix. Currently we’ve had an influx of Speckled Sea Trout, Red Drum and always our Chesapeake mainstay, the Striper. I thought these three species would make a great “slam”, my shirt inspires all of us to get that “slam”. I’m hoping to get many “slams” this year!!!!!!!! 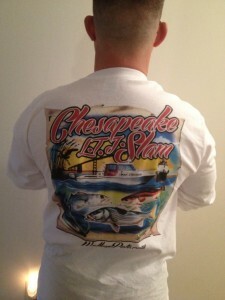 The front of the shirt will highlight a logo stating “Chesapeake “LTJ” Slam” and an outline of my boat. Currently I’ll be selling my shirts at the boat and possibly through the mail…..I can take credit card now (getting high tech)! Chesapeake “LTJ” (light tackle jigging) Slam Logo on the back…..it highlights a Striper, Speck and Red Drum….my boat is centered and it shows light tackle jigging structures……bridge, lighthouse and grass flats! 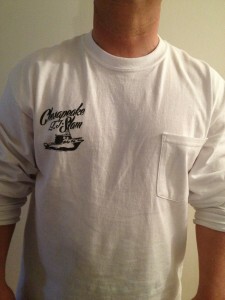 I’ve got plenty of shirts…..could send you one or you could get one when you come fishing next. Either way works for me. Hope to get your crew out there this year! Take care and thanks!